Welcome - Clarks Antiques offers true Western memorabilia. Clarks Antiques, antique firearms and collectibles, are sought after items for lovers of the Old West. True western memorabilia items carry with them the rich history of the American frontier. Antique Colts and Winchesters along with accompanying antique gun leather made before 1899 are true treasures of the Wild West. We have been collecting antique Colts and Winchesters of the Old West for over 40 years. Our collection of antiques range from Antique Colt Revolvers to Antique Winchester Rifles and Antique Ammo & Gun Leather and other Old West cowboy memorabilia. Our collection of Colts, Winchesters, period antique firearms, accouterments, antique ammunition, antique gun leather and Indian accessories are authentic pieces of American history. Clarks Antiques invites you to view our website to see what we have to offer. If you see something of interest, you can email or call us for more information and photos. Also check out our Show Schedule. For your convenience, we can bring items of interest to a gun show where you can inspect it personally. Read About Us and check out our Terms & Conditions. It is our goal to provide our clients with authentic period items with complete and accurate descriptions. We take the effort out of finding and authenticating the antiques YOU are looking for. Our many years of collecting and studying the Old West has given us the knowledge and experience in finding and identifying these vintage treasures for our clients. We travel far and wide looking for special items to enhance our collection. We want you to feel confident in your purchasing decisions from our site. Our pledge to you is that the merchandise offered, our ethics and practices are of the highest quality. Please browse around and check back frequently as we are constantly adding new inventory. We look forward to buying from you, selling to you and trading with you. The “Old Wild West” was a unique and very colorful era, lasting only about forty years. It began at the end of the Civil War and lasted slightly past the turn of the century. The nation was healing from a war that had threatened to divide the country in half. Those who fought and survived the war were looking to start a new life and the western frontier was beckoning them with affordable land and open spaces ready for settlement. The migration west by the settlers also brought a variety of colorful characters with them. You could say the good, bad and ugly. In California gold had been discovered and riches were waiting for those who could find them. Beef was bringing high prices in the east while cattle were running wild in Texas. All one had to do was gather up a bunch and herd them north to the new rail heads. Not as easy as it sounded, but very profitable if successful. From this another unique legend was created, the cowboy. Similar to the vaqueros of old Mexico, the cowboy copied many of their styles to move their cattle and build ranches. The weapons needed for this era were as unique as the people themselves. Settlers needed dependable weapons to hunt and protect their families from Indians and bandits. The cowboys likewise needed those weapons to protect their herds from predators, both four legged and two legged. And of course in the cow towns and the gold fields the gun slingers and gamblers were vying their illicit trades. Lawmen were being hired as the towns and settlements wanted more peace and quiet. What a wild, wonderful and dangerous place the old west was. The history, stories and myths will last forever and still excite the historian who seeks them out. Why did we start collecting guns of the Old West and create Clarks Antiques? Well, you just need to read all of the above. We have been collecting for over forty (40) years and we are always finding new treasures from that bygone era. Are we experts on guns of the old west? No, and don’t believe anyone who says they are. Some may know more than others and some may think they know it all, but in reality we are all just students of the subject. 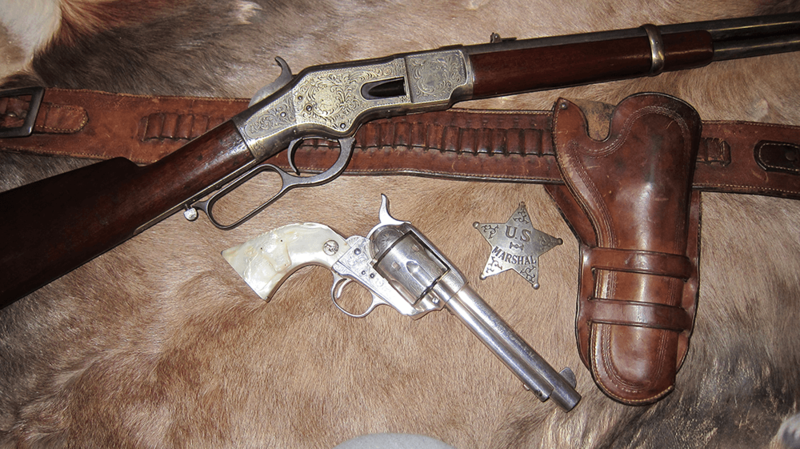 By the time I retired (I was an aerospace engineer for 48 years) we had accumulated a nice collection of high quality and hard to find old west guns. This hobby has turned into a passion for me and my wife. Buying, trading, selling and researching the old weapons have become a labor of love. We love the gun shows, the people we meet and the camaraderie of all involved. Sharing this passion is what we love doing most. You will see many antique Colts, Winchesters and other antique firearms for sale on our site. But Colt and Winchester are the guns that won the west. Many other firearms were purchased and used during that time span, but it was Colonel Colt and Oliver Winchester’s foresight that supplied the nation with the weapons they needed. It also created a financial fortune for them as well as a dynasty that has lasted over a century. Check out our collection of antique firearms. We do our best to give you a thorough and honest description and evaluation of each item. Being a student of the western era and the antique firearms involved, we are always learning new things and more information on the firearms themselves. If you see something you like, we will gladly provide you more photos and even take an item to a show we are attending for you to inspect it personally. Everything we have is not on the web site, so we invite you to inquire as to your wants as we may have what you are looking for. If not, we can look for what you are seeking from our dealer and collector resources. Our goal is to help you enjoy this hobby as much as we do and for you to feel confident with your purchase Clarks Antiques.